some 5,000 hours of sound recordings, 400,000 feet of film, 3,000 videotapes, 5,000 photographs and piles of manuscripts. Lomax was an ethnographer who traveled throughout the U.S. and, eventually, the world to record people playing music and talking about their art. He later became interested in dance and performance. His recordings document musical traditions from around the world and are an unparalleled resource for musicians and historians. Now, the collection is in the process of being fully digitized and made available for free on the internet. As I work on my dissertation and contemplate my career prospects, I am constantly confronting questions about the roles of scholarship, academia, and education in an era in which an unimaginable amount of information is available to anyone with a computer. What’s the role of researchers, writers, and educators when everyone can find the answers to their questions with a Google search? Reading about this enormous digital collection helped me figure out a way to articulate an answer. For 36 hours my Facebook feed has been overflowing with people angry at the Susan G. Komen Foundation for canceling grants to Planned Parenthood that paid for breast cancer screenings. According to the Associated Press, the grants totaled about $680,000 last year – which is not actually very much in the context of PPFA’s and the Planned Parenthood affiliates’ budgets, which totaled over $1 billion in FY 2010. More significant than the amount of money is the spotlight this puts on Planned Parenthood’s careful positioning as a women’s health care organization – emphasis on the health care. For nearly a century and a half, birth control has stood at the uncomfortable crossroads of medicine and services designed to empower women. Abortion was first outlawed in America in the 19th century as part of physicians’ (who were overwhelmingly male) efforts to make maternity care their responsibility rather than leaving it up to midwives (overwhelmingly female). But doctors didn’t quite know what to do about birth control, since it was preventive rather than curative - and they specialized in curing diseases and solving problems - so their solution was basically to not provide birth control. When Margaret Sanger founded her first clinic in 1916, she argued that women needed birth control in order to control their own lives, but she soon lost command of her own organization to male doctors who had more respectability and clout but played down the women’s empowerment side of their work. In 1942, they changed the organization’s name from the Birth Control League to Planned Parenthood so they wouldn’t scare people who were put off by the idea of women “controlling” their reproduction. 1928 Catholicism = 2011 Mormonism? Or is it Islam? Historian Robert Slayton has a column in the Times today about the anti-Catholic hysteria that Al Smith provoked when he ran for president in 1928 after four terms as NY governor. This is one of those pieces of history that, in my pessimistic moments, makes me think that we (as a society) haven't actually learned much from the past. It seems pretty clear to us now that it was, indeed, hysteria that caused people to think that, for instance, “if you vote for Al Smith you’re voting against Christ and you’ll all be damned,” or that Smith's election would mean that “you will not be allowed to have or read a Bible.” Shouldn't it be totally obvious to all Americans, then, that the election of a Muslim congressman would not result in sharia law (whatever the right wing means by that) usurping the U.S. Constitution? You Know Who Doesn't Need More Cash? Corporations and their shareholders. A study out yesterday from a group of U. Mass. economists says that major U.S. banks and corporations are in possession of $3.6 TRILLION in cash and other liquid assets, of which at least $1.4 TRILLION isn't necessary for their financial health and could instead be used to create 19 MILLION new jobs. They predict that if all of that money were actually spent on "productive investments and job creation" instead of remaining hoarded in the bank, the unemployment rate could fall below 5% by 2014. So the next time you hear that raising taxes on rich people and corporations would hurt "job creators" by taking the cash they need to hire people, it's worth asking whether these corporations would even notice if a small bit of that $3.6 trillion left their pockets to help pay for needed government services. When you're swimming in the giant pool of money, you don't notice when the water drops an inch. Also, check out this interesting take on why raising taxes would create jobs (hint: it's not because rich people would then willingly start paying more taxes). Does Anybody in Washington Have Any Actual Ideas? 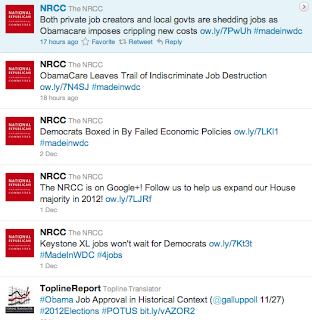 Instead of grading papers, I was procrastinating by browsing Twitter (obviously), which recommended that I check out @NRCC - the National Republican Congressional Committee. 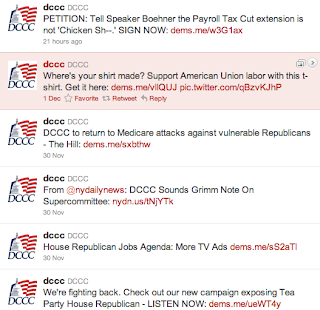 So I did, expecting to find something infuriating about the Republicans' positions - but I found something even worse: every single tweet is about Obama and the Dems. Do the Republicans have any actual ideas of their own? Keep in mind that these are the people in charge of shaping the Republicans' congressional campaign efforts and yet they seem unable to actually articulate something they stand for (although they're adept at finding things to oppose). 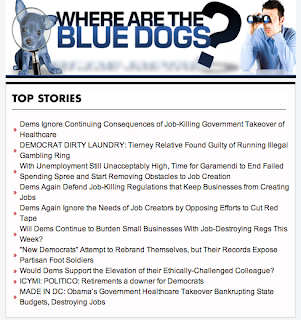 Why is their lead banner about the Blue Dog Democrats, rather than about something the Republicans are actually doing? 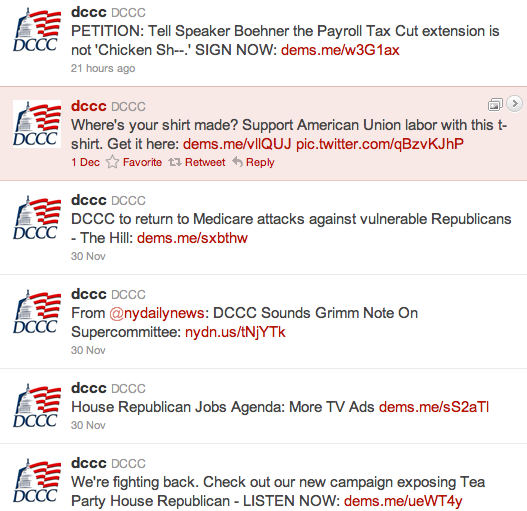 Supporting the DCCC is the single most effective step you can take to continue leading our country in a new direction. By fighting to retake the Democratic Majority in 2012 through protecting our Democratic members and electing new Democrats to Congress we can keep moving America forward. 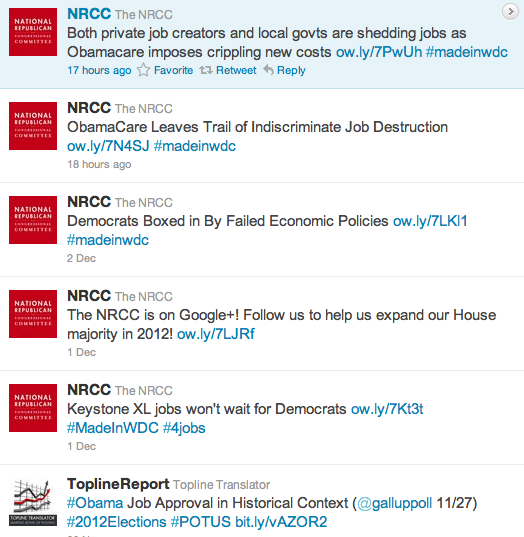 And what does "moving America forward" mean, exactly? Not to state the obvious, but perhaps we would end up with a more effective federal government if someone in either party came up with and advocated for actual ideas and policies, rather than just attacking the failures of the other side. 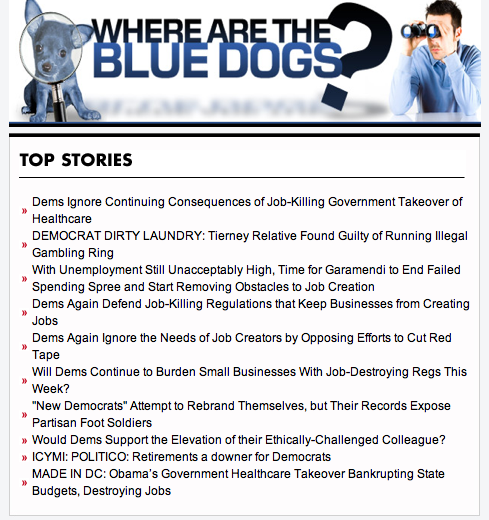 And so begins another day of righteous indignation at our politicians and political system.